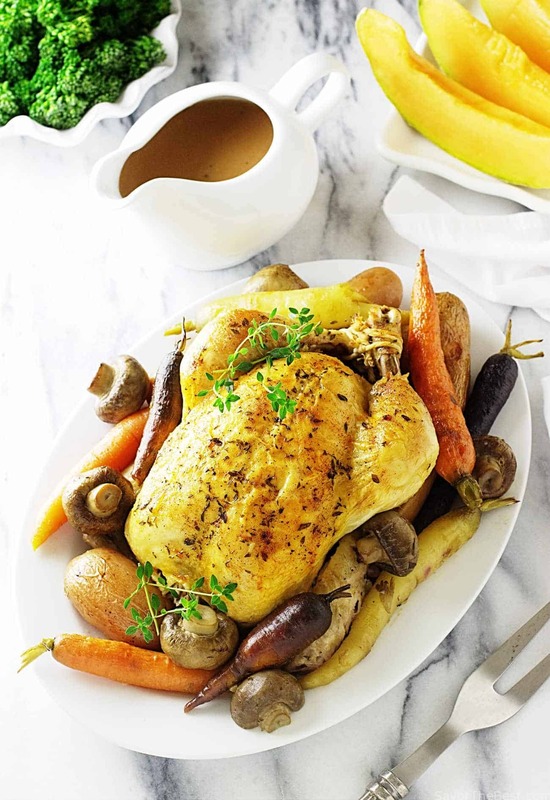 Roast chicken is one of life’s all-time comfort foods and to prepare a Pot Roasted Herb Chicken with a fat chicken, fresh herbs and vegetables is a classic meal in a pot. 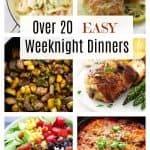 This is a recipe to make and serve any week-night or Sunday dinner yet special enough for company. 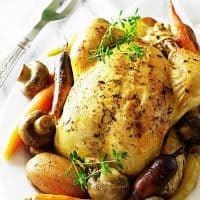 This French-inspired, pot roasted herb chicken is such a simple way to serve up a no-fuss dinner, and you will love the moistness of the chicken. 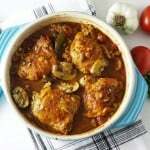 This is a one-pot meal with the chicken and vegetables all cooked in a covered brasier or Dutch oven. The chicken is moist and juicy; the vegetables are tender but still firm. 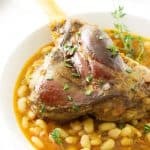 It is all served with a sauce flavored with white wine, garlic, thyme and a touch of Dijon mustard. It would be lovely to roast up one of those fat organic, free-range chickens for this recipe. The little farm where we buy our fresh eggs sells their home-grown chickens all ready to cook. However, they are sold in lots of six for a cash outlay of $163. That is a hunka cash and calculates to almost $30 a chicken. I just couldn’t do it. I have no problem shelling out the big bucks for a whopping big prime rib roast or a hefty chunk of halibut. But chicken?? I’m just not there yet. 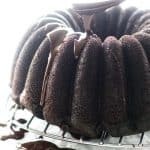 I would love to hear from you readers to let me know if I am truly missing out. For now, it will be a supermarket chicken. To prepare this chicken for the roasting pot we first liberally seasoned the bird inside and outside with a mix of salt, pepper, and paprika then browned it lightly in a little olive oil. 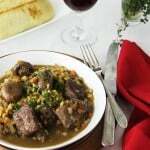 It was placed breast side up in a heavy-bottomed brasier with a little wine, fresh thyme sprigs, and garlic slices. The lid was placed on the pot and it was roasted in a 350°F oven for forty-five minutes. Then the rainbow carrots, red thumb fingerling potatoes, mushrooms and fresh thyme were added around the chicken. The lid went on again, and it continued roasting in the oven until the temperature registered 175*F on the meat thermometer. This chicken is moist, juicy and tender. 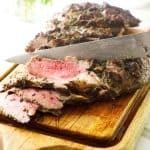 The vegetables are perfectly cooked and there was only a little au jus in the pan which we used to make a wonderfully rich and flavorful sauce with white wine, and Dijon mustard. 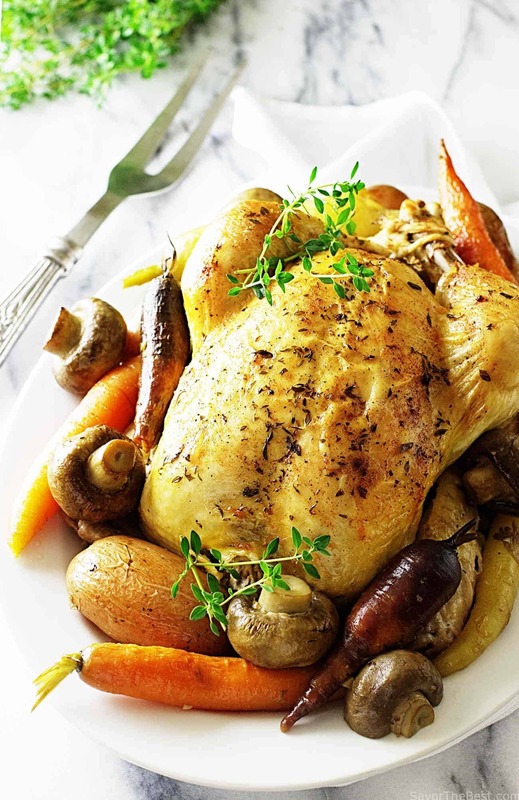 A French-inspired Pot Roasted Herb Chicken that is moist, juicy and tender. Served with rainbow carrots, fingerling potatoes, mushrooms and fresh thyme. Served with a wine-mustard sauce. Rinse the chicken under cold water and pat dry with paper towels. In a small dish, combine the sea salt, black pepper and paprika and sprinkle on the inside and outside of the chicken. Tie the legs together with kitchen twine. 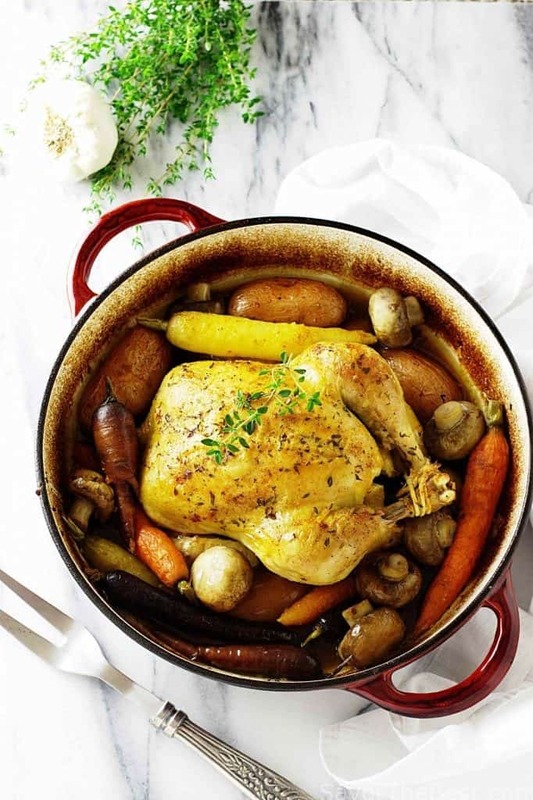 Add the oil to a Dutch oven or brasier pot set over medium heat, and when it is hot but not smoking add the chicken, breast side down and brown lightly, rotating to each side to brown lightly, about 8 minutes. Turn the chicken onto it's back and drizzle 1/4 cup of the white wine into the pan. Add the garlic slices, and the thyme sprig bundle. Place the pot lid on the pot and transfer to the middle rack of the oven. 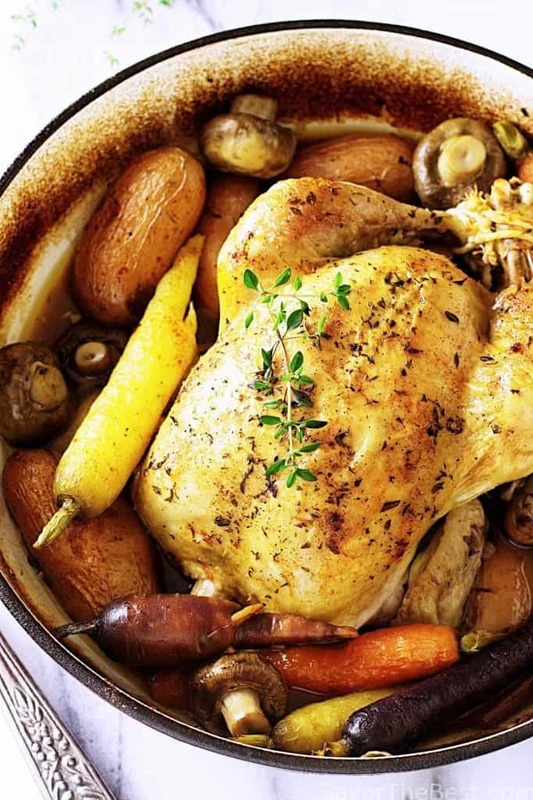 Roast for 45 minutes.Remove the pot from the oven and baste the chicken with a few spoons full of the pan juices. 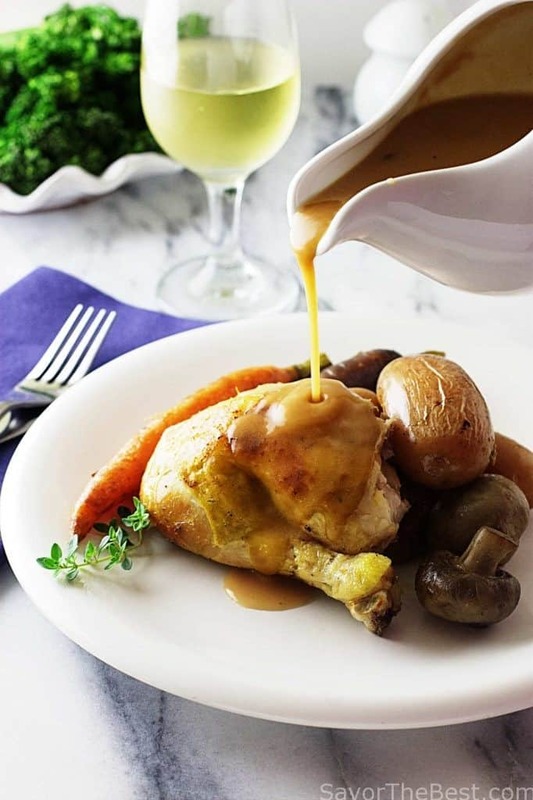 Arrange the vegetables around the chicken, add the lid and transfer back to the oven and roast for about 30 minutes or until an instant-read thermometer reads 160° in the thickest part of the breast and 175° in the thickest part of the thigh and juices run clear. 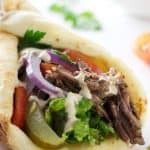 Transfer the chicken to a serving platter, cut and discard the trussing twine from the legs and arrange the vegetables around the chicken, cover lightly with foil and allow to rest while preparing the sauce. When ready to serve, garnish the chicken and vegetables with fresh thyme sprigs. Remove the thyme bundle and pour the pan juices through a strainer into a small saucepan, skim off and discard as much of the fat as possible. Add the remaining wine, the chicken broth and garlic. Bring to a boil and cook for about 5 minutes, reducing the liquid to 2 cups. Whisk in the Dijon mustard, taste and adjust seasoning if needed. In a small dish add the butter and flour and blend with the back of a spoon to make a paste. Remove the saucepan from the heat and add the paste, whisking until it is melted. Return the saucepan back to the heat over medium and continue to cook for 2-3 minutes until slightly thickened. Transfer the sauce to a serving pitcher and pass with the chicken and vegetables. If your chicken is large and touches the lid spray the inside of the lid with non-stick oil spray to prevent the flesh from sticking and ripping when the lid is removed. Aluminum foil can be substituted for a lid, spray the inside of the foil with non-stick oil spray and cover the pot tightly. What beautiful photos you have! The chicken looks very juicy and flavorful! Perfect for the upcoming holidays! Beautifully done chicken! I love the roast veggies with the gravy pouring down on the thigh. Exactly how I like it! Very nice. One pot meals are the absolute best! And herbs make everything even better. That might just be the prettiest chicken I’ve ever seen! (But I bet that didn’t stop you from eating it lol). Looks amazing!!!! love it all in one pot, for convenience and flavors! thanks for this and no way $30 per chicken, does chicken get that good? Maybe it does but not for that price!